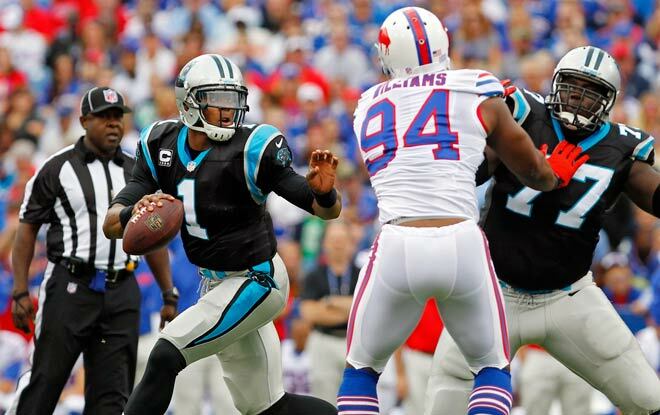 According to sportsbook sites, the Carolina Panthers are 6.5-point home faves against the New York Giants. The Giants sputtering offense doesn’t fill the best online sportsbooks with confidence, nor should it. Wide receiver Odell Beckham Jr. is one game shy of matching his longest touchdown-less streak (5). “It’s not all about just throwing it deep every play; that’s not the answer to our solution,” starting QB Eli Manning said. “I know that’s what everybody wants to do. It’s an easy thing to say, ‘Yeah, we’ll throw it deep and all of our problems will be fixed.’ It’s still about finding completions and when you do throw it down the field, completing it.” Well, maybe that’s what’s wrong. Brother Eli should be looking for the answer to the problem, not the answer to the solution. As a matter of fact, I would dare say that “answer” and “solution” are synonymous. Manning has been struggling with consistency. He passed for 297 yards in Week 3’s 27-22 win over the Houston Texans. One would have thought he’d have a field day against the Saint’s No. 30 pass defense. However, he had just one TD pass against New Orleans and was sacked three times. Defensively, the Giants allowed running back Alvin Camara 134 yards and three TDs on 19 carries. The Giants offensive line better be shaking in their cleats on Sunday. Running back Christian McCaffrey rushed for 184 yards on 28 carries – 6.6 yards per carry – against the Bengals before the bye. Expect the Panthers to keep feeding him the rock versus the Giants. Cam Newton himself, being more a running than a passing QB, should put up big numbers on the ground. Cammie is averaging just 215 yards through the air per game this season. However, that should be enough for sportsbook sites’ users. Carolina is 41-35-1 SU and 43-30-4 ATS when he throws for 200 yards or more. The Panthers are 3-0 SU and ATS in their last three games after a bye. And 6-4 SU and 5-5 ATS in their last 10 after a bye. Carolina is bound to improve on all those records this Sunday. This game will be decided on the ground. Though Giants running back Saquon Barkley will probably have no bearing on the outcome. The Panthers’ No. 1 rushing offense versus the Giants’ No. 29 run defense makes it a no-brainer that sportsbook sites back Carolina.